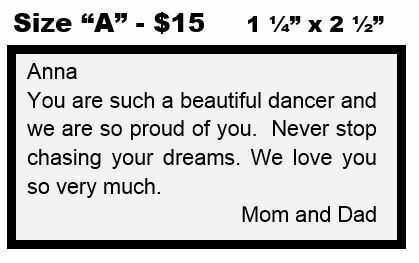 Place an 'ad' in the PMDI Spring Recital Program to support your dancer and to help support NCDT. Orders must be placed by April 15. Space is limited, so order your ad space now! Ad Size "A" - $15 - Text only, 140-160 characters maximum please. Ad Size "B" - $25 - Photo and Text, 150-175 characters maximum, photo can be vertical or horizontal. Ad Size "C" - $40 - Photo and Text, 350-400 characters maximum, photo can be square, vertical or horizontal.